– Trouble at Twitter is a Fortune article talking about how Boardroom antics, CEO switches, and other distractions are keeping Twitter from progressing. – Twitter turned down a $10 Billion offer from Google, and the Business Insider claims that although they have 200 million registered users, only 20 million are active. If Larry Page comes back again, they admonish Twitter to take the money and run. There is a tiny dose of positivity (hey, sometimes you have to make up a word) in the form of people loving new Twitter mobile client Tweetbot, but it is tinged with almost totally offsetting negativity by fretting over whether Twitter’s Draconian “Write no Twitter clients policy” will let it survive. There, I’ve laid the grenade on the table, sans pin. Before we get started analyzing the premise of whether Tweets are ads, I’m sure we ought to spend a little discussion on why this is a problem. The answer to that one is pretty simple–would you want to pay for advertising in the middle of a sea of free ads? For the most part, don’t you capture most of the value by just firing off a salvo of your own free ads, er tweets? The problem is diminishing returns and inventory. To want to pay to run an ad among ads, you’ve got to want to be seen pretty badly and you need to run an ad that really sticks out. Like the Dickbar, for example. Unfortunately, there isn’t a lot of inventory available for big noticeable ads and Twitter’s users hate them. Other than that, it’s a pretty good idea, but not one that will deliver $10B valuations. Still, all sarcasm aside, you can see why they had to try something like that if you think Tweets are Ads. How else to be seen in a see of other ads? Go through the classified advertising sections in what few print periodicals are left. There are very few ads there. It’s not a happy place for ads, curiously enough, even though you have an audience spending time there because they presumably want to buy. It’s not happy because of the inventory and cost problem. Simply put, there is a hole in the middle of the continuum between cheap (just run a classified or type the darned Tweet) and getting seen (run a big ad that is much noisier than the classifieds or tweets). That’s not to say you can’t run effective ads there, as I say, people reading classifieds presumably are looking to buy something. But there is not enough inventory to sell there to make it all that lucrative and what inventory you do have must be pretty high-priced. Contrast that with something like Facebook. There you are running ads in the middle of a water cooler / friends chit-chatting conversation more so than amid other ads. It’s still not really ideal, but it is much better, hence Facebook is making a lot more money relative to their participation. Okay, if you assume Tweets are Ads, you can see Twitter’s problem pretty clearly. But are Tweets really ads, for Heaven’s sake? The short answer is, most but not all Tweets are ads. You have to admit that every bot-generated Tweet is essentially an ad. ”Come read my new blog post!” That’s an ad, let’s be real. Or, perhaps to be more precise, it isn’t an ad to the industry because you didn’t pay for it. It’s more like PR or a press release. Nevertheless, functionally, it’s an ad. It’s a message you put out there to drive traffic. Heck, with only 140 characters, you can’t hope to do much more than drive traffic. There aren’t enough characters there to actually inform anyone of anything momentous. There’s certainly not enough there to convince. Your only hope is to create enough shock value to get people to click a link and look further. Isn’t that starting to sound an awful lot like what an ad does? Are Retweets ads? Well, depends on the Retweet. It’s sure hard to argue that when you RT every darned Tweet that mentions you, your products, your company, or anything you ever Tweeted, Blogged, or said in a private inner dialog that you aren’t advertising. I mean come on, we’re back to doing what those darned bots do. Where’s the creative insight in that? Twitter doesn’t even let you comment on the RT when you use their button, you’re just rebroadcasting someone else’s message to your flock because you happen to like or agree with it. Try this experiment. Stop what you’re doing right now (i.e. quit reading this blog post), go to your Twitter account, and scan the first screen. Be really dispassionate. How many of the Tweets there could be called ads in the sense I’m using it? – I got 5 repeats that are identical. They say “Twitter’s Troubles” and link to one of the articles I gave above. – I got 5 that are identical and say, “Tweetbot enters the IOS Twitter client fray” with a link to that article. These are all bloggers and follower-seekers of one kind or another. They’re all saying exactly the same thing. They’re probably automated they are so darned similar, although I’m not personally familiar with the tools that do that. Disclaimer: I was shocked to see so little variety. There are times when I do see long runs like that, but subjectively, I’d say it is more like 80% ads, 20% valuable insights than this sample would imply. Nevertheless, since it is bash on Twitter day, I was happy to be able to make my point. These are all ads. Twitter’s problem is that when the vast majority of your content is advertising you give away for free to get participation, it’s going to be very very hard for you to sell additional ads on top of that for revenue. 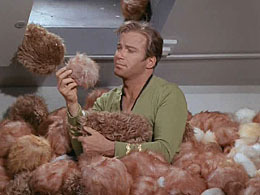 I was tempted to call this post “The Trouble with Twitters” but there probably aren’t enough Trekkies left in the world to have any idea about Tribbles and Twitter, so I contented myself with the photo. Zoli Erdos points to a bit of Twitter Schadenfreud I missed.